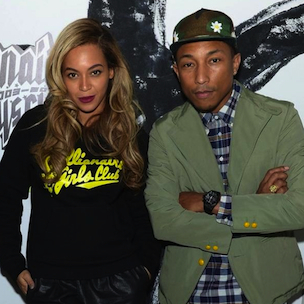 Pharrell recently spoke about Beyonce’s upcoming album, which he has reportedly been working on. Aside from working with Beyonce, Pharrell also discussed his other upcoming collaborations during his Billboard interview. “At the moment, I have a collection,” Pharrell said. “I just got the opportunity to check it out and see what it’s about. Fear of missing out is a marketing tool. And it doesn’t have the gravitas that we’ve been convinced it has, because, essentially, you can find whatever you’re looking for on eBay. I’ve learned that eBay isn’t the place I thought it was. I thought it was a glorified yard sale. It’s not. It’s a place that is meant for convenience and where people can actually convene.